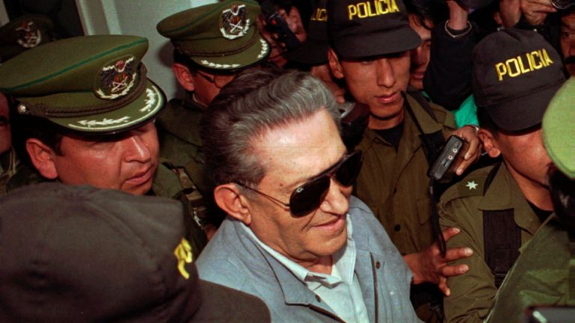 LA PAZ, Bolivia — Former Bolivian military dictator Luis Garcia Meza, who was serving a 30-year prison sentence, died Sunday. He was 88. Garcia Meza was admitted to a military hospital in La Paz after suffering a heart attack and could not be resuscitated. A medical report said he died "from possible respiratory failure." The Cossmil military hospital told The Associated Press that the death occurred at 3 a.m. The former army general was imprisoned for crimes including murder and economic damage to the state during his 13 months in office from 1980-1981. He was convicted in absentia and extradited to Bolivia from Brazil in March 1995, but he completed much of his sentence at the hospital where he died. In January 2017, a Rome court convicted Garcia Meza and seven other former South American political and military leaders for the disappearance and deaths of 23 people of Italian origin during the crackdown on dissidents by the region's military dictatorships. Garcia Meza's former interior minister, Luis Arce Gomez, was also sentenced to 30 years in prison for political killings and extradited to Bolivia from the United States. The Bolivian military leader led a bloody coup in July 1980 that deposed President Lidia Gueiler as the country was trying to return to democracy after 16 years of dictatorship.